Reuters-TIMA provide broadcast facilities in New York and Washington DC for the US election. Ahead of the 2017 Presidential Inauguration, our team at Reuters-TIMA share their 2016 US elections broadcast stories. New York, Washington DC, January 2017: Reuters-TIMA Location Services set up broadcast facilities at many locations in New York and Washington DC. 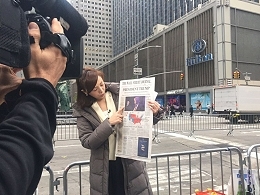 This gave clients the opportunity to report live from the scene of one of the most important events of 2016: US elections. As American voters went to the polls, we broadcast from New York and the roof of our office which overlooks the White House. Leaving London on the morning of Nov. 5, 2016, we knew these US elections would be like no other. Some of the team met in Heathrow for the flight to New York, then made their way to different Reuters TIMA locations. We broadcast from Times Square, The Javit Center, and the Hilton Midtown – my location. Mixed emotions of enthusiasm and concern stirred the group. Organizing the logistics for Elections’ coverage was challenging. Candidates had never left the announcement of their HQs so late, or an accreditation release from a candidate been so mysterious. Never had the world’s media covered an event, anticipated for four years, with limited information. The atmosphere at the Trump headquarters was confusing. Most international media were denied accreditation by Trump’s campaign “due to venue size, media space, and safety”. Every media outlet, including Reuters-TIMA, crafted an alternative plan of action to put in place as quickly as possible. Hours passed as we live broadcast back-to-back, alternating clients at our two positions. Despite the limited space, clients and colleagues found a system to get what was needed. As the evening drew to a close, the atmosphere began to heat up. Anti-Trump protesters and Trump’s supporters filled the street. Both sides careful not to leave the area before vehemently and colourfully expressing their opinions. We worked straight through the night of our lives, from the first States being called to the winner’s speech. Teams started to de-rig around us and the crowds dissipated as our last hit with TV Tokyo finished. A quiet morning had started in Manhattan. Taxi drivers were rushing people to work, coffee and bagels in hand. It was as if history hadn’t just been made in the same streets. Reuters-TIMA Location Services will be covering the 2017 US Presidential Inauguration. Find out how to book your live coverage of this historic event.